Yanmar Marine USA Corp offers the lightweight, electric steering ZF Zeus 3500 and 3800 Pod drive propulsion systems. These state-of-the-art Pod drives are specifically designed for Yanmar diesel engines in the 400-575 hp range. 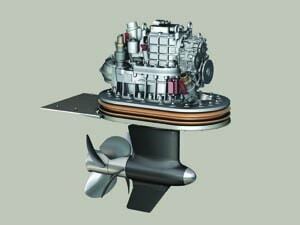 Yanmar Marine also has two smaller Zeus 2800 and 2500 Pod drives for engines up to 450-horsepower. Depending on the boat and operating conditions, they can significantly improve top-end performance, cruising speed and fuel economy. A cockpit-mounted, intuitive joystick enables one-handed control of the entire system. For twin installations, each drive moves independently, resulting in superior turning capabilities and throttle response. Even at slow speeds or when docking, the advanced ZF Pod drives provide the same precision steering. The Pod drives' hydrodynamic design and propeller positioning counteract drag to enhance performance. Installation inside the hull decreases draft and rubber mounts reduce gear noise and vibration for a quiet, comfortable ride. Mounted in a tunnel, the torpedo shape of the ZF Pod drives from Yanmar Marine are the same depth as the keel and deflect most floating objects downwards and away. In case the drives hit underwater debris, the aft-facing propellers are shielded by the gearcase and skeg. Engine exhaust is conveniently vented through the propeller hub. Twosacrificial pieces are incorporated to protect the system and secured by bolts that break away at impact, avoiding damage to the hull. Based in Adairsville, Georgia, Yanmar Marine USA Corporation is the leader in compact, powerful and reliable marine propulsion engines. They offer an extensive range of pleasure boating diesel engines from 9.1- to 900-horsepower.